Avoid Paper Jams by PROPERLY Loading Your Paper Tray – Laserlite Inc. The printer is out of paper. This little inconvenience forces a pause in production while you hunt down a stack of clean paper and then reload the tray. It may feel like an interruption in the flow of progress, but the time required is brief, and doing it properly is more vital than you might think! Here’s a fact: improper loading of the paper tray is a common cause of paper jams—a frustration that steals more time from production than the few minutes required to load the tray correctly at the start. The problem is the potential for pages to be positioned wrongly when fed into the printer. 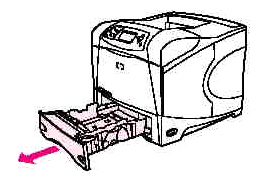 The whole process of feeding a piece of paper through a printing machine requires precise timing and placement from beginning to end. Even a slight misalignment can cause the printer to jam. That is why paper trays are designed with width and length guide tabs to keep stacks of paper stationary and in a proper starting position until the feed rollers pull one page at a time into the machine. If a page is pushed too far back or sits loose and askew because of wide-set guide tabs, it will be misfed (pulled crookedly or too far inside the printer) and spoil the timing right off. Hence—an aggravating paper jam! I.) 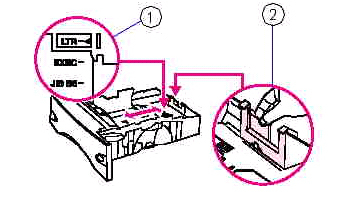 Completely remove the tray from the printer rather than sliding it partway open. 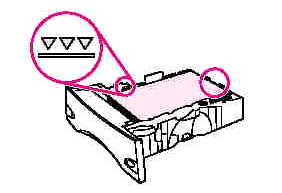 It is important to check the rear length guide tab that holds the paper stack in place deep inside the paper tray. Pinch this rear length guide and slide it to the correct paper size. 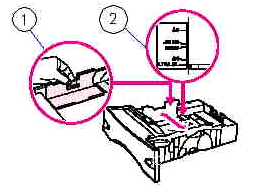 Make sure it is securely in the right slot for the size of paper you are using. If it has slipped into the wrong position (even by an 1/8 inch) this may cause a paper jam. II.) Now, pinch the width guide tab that is located on the left and slide it to the correct paper size. It may already be positioned in the correct spot; double check. Do the same with the right guide tab. III.) Load paper with the front side facing down and the top edge toward the front of the tray. Try to keep the stack of paper in an even pile. Do not fan the paper; this can cause misfeeds. Never use paper that is folded, crumpled, or misshapen. IV.) Check to be sure that the paper stack is flat at all four corners and that the top page sits BELOW the maximum-height indicators. Never fill the paper tray to capacity; this is another frequent cause of paper jams. 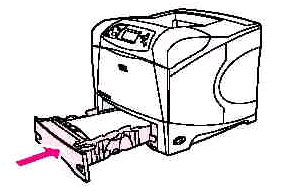 V.) Slide the tray completely into the printer. It is now ready for use.